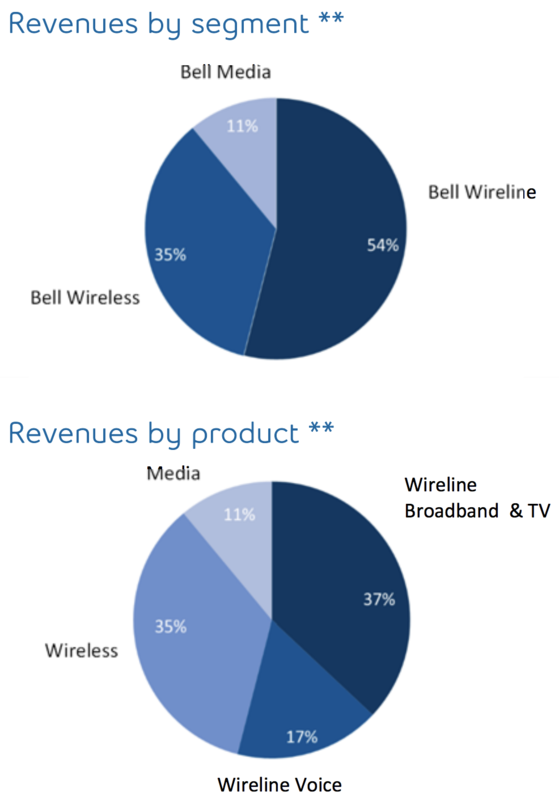 Bell Wireless (35% of sales, 50% of cash flow): offers integrated digital wireless voice and data communications products and services. Bell Wireline (54% of sales, 39% of cash flow): provides data, including Internet access and Internet protocol TV, local telephone, and long distance, as well as other communications services and products. This segment also offers business service solutions, such as hosting and cloud, managed, professional, and infrastructure services; and Web and audio conferencing, and email solutions. Bell Media (11% of sales, 11% of cash flow): owns and operates approximately 30 conventional TV stations; 34 specialty and pay TV channels; 105 radio stations; 30,000 advertising faces; and 200 Websites. This segment also offers out of home advertising services and digital media services. While the majority of BCE's revenue (about 55%) comes from the wireline segment, the wireless segment is the fastest growing and highest-margin part of the company. BCE offers its services through a network of corporate and dealer-owned retail stores, national retailers, and call center representatives, as well as websites and door-to-door sales representatives. BCE is the largest player in Canada, commanding over 30% market share in the country's $60+ billion telecom market, which is growing about 3% per year. BCE's appeal as a long-term income growth investment stems from several attributes, starting with the oligopolistic nature of the industries in which it competes. In Canada, BCE is the largest internet service provider, the largest TV provider, and one of the largest wireless operators. Wireless is arguably the company's most important business since it generates approximately 50% of BCE's cash flow. 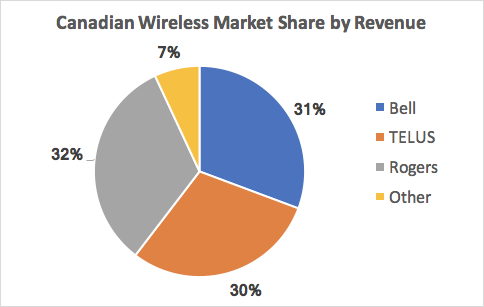 As you can see, Bell and its two national rivals Rogers Communications (RCI) and Telus (TU) command over 90% of Canada's wireless market. Unlike in the U.S. where increased pricing competition has caused AT&T (T) and Verizon (VZ) to see declining average revenue per user (what BCE calls average billing per user or ABPU), in Canada the big three wireless providers have avoided a price war. This has allowed revenue per user to slowly but steadily climb over time. However, thanks to relative network parity between the three national giants, these higher prices are not resulting in higher monthly churn rates. In fact, churn levels have remained low and fallen over time (and on par with what AT&T and Verizon enjoy in the U.S.). BCE routinely invests hundreds of millions of dollars in its wireless network each year to improve its performance and coverage. For example, the firm's LTE wireless service was available to 99% of Canada's population in 2017, and the firm's network achieves industry-leading speeds. BCE's investments have enabled it to enjoy the largest proportion of industry revenue and adjusted EBITDA growth since 2009. Continued population growth, the trend toward owning multiple connected devices, greater data usage, and increased mobile adoption (Canada's wireless penetration was 85% in 2017 compared to over 100% in the U.S. and Europe) are all expected to drive mid-single-digit growth in the nation's wireless market going forward. However, that pace of growth is still relatively slow compared to many other industries, making it hard for new entrants to disrupt the incumbents. Specifically, the high cost of building out a nationwide network (including hard-to-acquire spectrum) demands a very large subscriber base to support ongoing costs. The industry's three giants have the greatest economies of scale and lowest costs per subscriber, making it extremely difficult for smaller players to try and gain market share. Simply put, it's a lot easier to maintain an existing subscriber base than acquire a new one, especially in mature, capital-intensive markets. As a result, BCE routinely enjoys adjusted EBITDA margins in excess of 40%, solid postpaid net additions, and rising ABPU in its wireless division. Similar advantages exist in the internet and TV markets, where BCE is the largest player in Canada. In the internet market, the four largest cable companies had about 6.7 million subscribers at the end of 2017, representing 54% of the total market. BCE has been investing heavily to deploy its broadband fiber network in more areas to strengthen its advantages. For example, BCE's fiber network now encompasses 70% of the population and reaches 2.7 million households. The company recently made a big push into broadband internet in Toronto where BCE's extensive network can connect to 1.1 million households, or 87% of the city. In Toronto, BCE's market share is just 17% and management sees big growth potential there. By the end of 2018, BCE is on track to bring direct fiber connections to a total of 4.5 million locations – approximately 50% of its long-term direct fiber build – to provide fast internet, Fibe TV (an IP-based television service) and other services to even more Canadians. These major investments have allowed BCE's internet business (as well as internet protocol TV or IPTV) to continue gaining subscribers at a quick rate to offset declines in its satellite TV business and legacy landline phones. The company's media business (11% of total cash flow), while much less profitable (17% adjusted EBITDA margins), is also far less capital intensive with under 3% of revenue going to spending on new content and upgraded capacity. For comparison, BCE's company-wide capex exceeds 15% of revenue most years. The media segment's most important role is to help drive stronger retention for wireline, specifically the firm's fast-growing IPTV business, which is BCE's answer to cord cutting. That trend, the bane of U.S. telecoms, is also present in Canada and causing BCE's satellite TV subscriber base to shrink. Management expects free cash flow to grow about 8% in 2018, which is good news for income investors because because management targets a 65% to 75% free cash flow payout ratio for the dividend. BCE has raised its dividend 14 times since 2008, including a 5.2% boost announced in February 2018. The firm's dividend has grown by 5% or better for 10 consecutive years while maintaining a payout ratio within management's target policy range, demonstrating the cash-rich and predictable business model BCE enjoys. BCE's final competitive advance is leveraging its size to gain access to low cost capital, a major plus in a highly capital intensive industry such as telecom. By maintaining a strong balance sheet, BCE is able to borrow cheaply to fund growth spending and acquisitions. Thanks to its very stable cash flow and recession-resistant business model, BCE enjoys a BBB+ credit rating from Standard & Poor's and equivalent ratings at the other major credit rating agencies in the U.S. and Canada. As a result, the company is able to borrow at an average pre-tax interest rate of 4.3% and with an average maturity of 10.4 years. March 2017: bought Manitoba Telecom Services, or MTS, for $2.9 billion (plus $972 million in net debt assumption) to expand its wireline subscriber base by 5%, or about 700,000 customers. October 2017: spent $200 million French-language specialty channels Séries+ and Historia (documentaries, reality shows, dramas) - expected to close mid-2018. January 2018: $182 million to buy AlarmForce, a provider of security alarm monitoring, personal emergency response monitoring, video surveillance and related services to residential and commercial subscribers. Prior to these deals, BCE spent $1.65 billion on other major acquisitions since 2015 including: expanded HBO rights in Canada, a data center operator, and an outdoor (billboard) advertising company. The company's goals are to avoid excessively large (and often overpriced) deals and instead focus on bolt-on acquisitions that strengthen its core businesses and can be easily integrated into its existing asset base. Management's strategy usually allows for easier cost savings (eliminating redundancies) and helps generate the kind of strong profits and free cash flow needed to support a generous but secure dividend. Management's top priorities going forward are to continue expanding BCE's fiber network to drive strong growth in broadband internet and IPTV. The firm is also focused on the upcoming 5G transition that holds promise for not just expanding its existing wireless business, but potentially also pushing it deeper into other industries such as the fast-growing Internet of Things arena. Overall, BCE represents a solid Canadian telecom whose competitive advantages make it a decent source of growing income. However, there are several risks that investors should consider before investing. First, it's important to point out that as a Canadian company, BCE pays its dividend in Canadian dollars. This creates some currency risk in that a stronger U.S. dollar might decrease the effective dividend amount for American shareholders, at least in the short term (each quarterly dividend is converted from Canadian dollars to U.S. dollars when it is paid, based on prevailing exchange rates). In addition, like all Canadian stocks, BCE investors will face a 15% foreign dividend tax withholding, except in retirement accounts such as IRAs and 401Ks. Tax treaties between the U.S. and Canada allow U.S. investors to potentially recoup this withholding, but it can be a complicated and lengthy amount of paperwork at tax time. There are several company-specific risks to consider as well. First, cord cutting remains a headwind for the company, with a steady decline in legacy landlines and satellite TV subscribers expected to weigh on the wireline business going forward. Fortunately, growth in other businesses, including IPTV and broadband internet, are expected to more than offset these declines. But that brings up other risks. For example, the telecom industry (especially wireline) is incredibly capital intensive. In fact, BCE is spending 24% of its wireline revenue on capital expenditures, mostly to grow its fiber network which connects to several million homes. BCE spent over $850 million alone on building its Toronto fiber network, which represents a cost of about $860 per household. Rogers, which already had an existing network in place, has an incremental cost of just $39 per household. In other words, while BCE is likely to be able to win market share in fiber internet, and thus keep its internet business growing quickly for several years, it might come at the cost of higher capex spending which could cause free cash flow growth to slow. And Toronto is far from the only area where BCE's spending is likely to go up. For instance, in Eastern Canada the company is not nearly as dominant as it is in Quebec and Ontario. In that region, BCE mostly uses legacy copper landline wires for internet service, which is more costly to maintain than fiber and also offers slower service. In the Eastern parts of the country, BCE faces stiff competition from regional wireline rivals (Videotron, Cogeco, and Eastlink) while Rogers is the dominant national internet provider in those areas. All have far larger fiber networks for their internet offerings which are faster and cheaper to maintain. 5G is expected to enable not just faster smartphones, but also home-based gigabit internet service (about 3 to 10X faster than currently exists). It will also serve as the backbone of the "Internet of Things" in which data transmission sensors will be incorporated into infrastructure, industrial machinery, and vehicles (driverless cars and trucks). This will enable real-time data monitoring that will make maintaining and maximizing the efficiency of infrastructure and industrial equipment easier, as well as potentially revolutionize ground transportation. However, it also means exponentially more data that will require substantial amounts of new and expensive telecom infrastructure. That includes not just telecom towers (which usually cost over $300,000 each to build), but small cell telecom nodes and fiber backbone to carry the data itself and connect to towers and nodes. It also requires large amounts of wireless spectrum (data capacity) that all telecoms will need to buy more of. BCE currently has a large fiber network and a good amount of spectrum it didn't overpay to acquire. However, going forward the firm might need to be more aggressive when bidding on spectrum to ensure its 5G network will be competitive with Rogers and Telus. Regulators have expressed concerns that having just three national wireless carriers might be bad for competition. leading them to become more hostile with recent rulings. For example, in 2015 the CRTC forced the big three wireless carriers to lower roaming fees for regional rivals to make them more competitive. Analysts believe that further roaming fee cuts are likely. In addition, the CRTC capped wireless contracts at two years (down from three). More threatening is the fact that BCE's wireless network only achieved parity with Rogers after its network sharing agreement with Telus was approved in 2009. If regulators decide this is anti-competitive, then they might force Telus and BCE to abandon it. That would mean BCE would need to build a lot of duplicate wireless infrastructure merely to get its wireless network back to parity with Rogers. And even if this worst case scenario doesn’t happen, it’s possible that future attempts to acquire regional rivals (like the recent MTS purchase) will be blocked on antitrust concerns. In other words, BCE’s large size could end up working against it by making future growth through acquisitions more challenging. A major new entrant could also disrupt the Canadian telecom industry’s favorable structure. In 2012, for example, the industry grew fearful that Verizon was planning to buy wireless company Wind Mobile in an effort to enter Canada and challenge the three major incumbents. Valuation multiples quickly dropped between 7% and 27% for Telus, Bell Communications, and Rogers. While the potential threat from Verizon never materialized, cable operator Shaw Communications (SJR) ended up acquiring spectrum-rich Wind Mobile for $1.6 billion in March 2016, marking its entry into the wireless market in an effort to better compete with its rivals' bundled services (Shaw can now offer television, wireless, and internet in major urban areas such as Ontario, Alberta, and British Columbia). Shaw rebranded the wireless business Freedom Mobile and is positioning it as a lower-priced option compared to the major three operators (driven by its inferior service quality). Regardless, Shaw is looking to play the role of disruptor and is now the fourth telecom company to cover the entire length of Canada. Should Freedom Mobile improve its network coverage and quality enough to experience strong growth (the company only had 4% of Canada's wireless subscribers at the end of 2017), the big three incumbents could face subscriber growth pressure and margin compression over the coming years. The good news is that the Canadian wireless market continues experiencing healthy growth, providing a little more elbow room, and BCE continues to report sold network performance and customer service results, as demonstrated by its subscriber growth and churn rates. Only time will tell if BCE’s superior network quality and customer service will allow it to continue enjoying its industry-leading growth, or if it will ultimately face the greatest pressure to lower prices in an effort to close the gap with lower-priced competition. That's arguably the biggest risk factor investors need to monitor. Finally, we can't forget about the dividend. While BCE's dividend is safe and growing steadily, keep in mind that management has a policy of paying out 65% to 75% of free cash flow. In 2017, the firm's free cash flow payout ratio was at the high end of management's target range. With BCE's big push into fiber in Eastern Canada, as well as the upcoming 5G transition, BCE's free cash flow growth rate could slow in the coming years. In fact, due to its already large size and market saturation in Canada, analysts expect BCE's earnings and free cash flow to grow at about 3% annually over the next decade. That pace of expansion is essentially in line with the industry's growth rate, indicating that 3% is likely the company's long-term dividend growth potential. BCE represents a solid Canadian telecom that has many positive attributes, including strong market share positions in most of its core business lines, substantial economies of scale, and access to low cost capital to help it meet its future growth plans. When combined with the non-discretionary nature of most telecom services, BCE is able to generate stable cash flow that supports a generous and slowly but steadily growing dividend. The biggest knock on the company compared to its peer is its larger exposure to residential landlines and satellite TV services, which are under pressure from cord cutting. However, BCE's wireless, internet, and IPTV businesses are all attractive and more than offsetting subscriber losses elsewhere. Investors considering the stock just have to realize that BCE is unlikely to deliver more than 3% to 5% annual dividend growth over the long term, making it all the more important to buy the stock at an attractive yield.